On the behalf of Atin Afrika, I wish you a Happy New Year. With sincere gratitude, I bring forth our appreciation for your continued generous funding that came in for the operational year 2018 to support our programs. You have empowered us to make immense impact on vulnerable children across the country and to expand our impact to other parts of the community, especially to widows. The funds have been the back bone that support our cause and objectives towards making a difference in these precious lives. I hope that this report gives you a greater picture of how much we have accomplished with the funds that we received. We have managed to run different programs within the confines of Atin Afrika in areas including education, health, rehabilitation, family counseling and strengthening, workshops, street outreach, and community outreach as a preventive measure to reduce the number of children running on the streets. As always, education is the primary goal of our cause at Atin Afrika foundation. With the funds we were able to continue supporting children through our scholarship program. This included the payment of school fees, the provision of scholastic materials, and monitoring of progress. This has been a great success for several of the children we serve, while at the same time we have worked hard on the challenge of a few dropping out due to the feeling of not being able to push on. This year, we are happy to report that two of our eldest boys, Ogwal Darius and Okullu Vianny, finished their secondary school programs. Okullu Vianny decided to join a trade skills school where he can learn to do carpentry and wood joinery. During this holiday he was able to work around town as a way to introduce himself to the course he is about to start studying in 2019. We are very happy with the decision he has taken and his studies will take him two years. We have started calling him “Vianny the builder” at Atin. Beyond education, with the funds, we have also managed to impact over 120 community individuals who are vulnerable to poverty. We have largely accomplished this through the provision of resources such as farming tools, especially for widowed and/or single mothers. We use this outreach as an opportunity to sensitize and raise awareness of the dangers of children living on the streets. Due to lack of basic needs, a number of children are forced to run away from the situation and go to the streets to try and fend for themselves. The funds have enabled us to start addressing these factors that “push” children into risky situations such as exposure to life on the streets. This year was also one of tragedy and setback for Atin in some ways. With great sorrow, we bring you the sad news of the passing of one of our children, Okaka Daniel. Daniel left school to visit his friends and sadly he was mistaken for a thief. Due to the fact that he was deaf mute, they did not know why he kept quiet while they asked him questions. As a result, he was mobbed and brutally killed. We are working hard with the law to make sure justice for Daniel is prevailed. The suspects are under custody. A major setback for us came from government policy this past year. Unfortunately, we were unable to admit new kids in the new center due to the new policies under the children’s act for all child-related service providers. Uganda has had issues with children being trafficked in the name of adoption and a number were coming from other children’s centers. The government worked to strengthen the law this past year and ensure the quality of services given to vulnerable children was high. The change means that we need to obtain a foster operating certificate, which we are expecting to receive by the end of February. Despite this setback, we were able to use our shelter space for office work and to hold influential workshops throughout 2018. Further, all our resources are still intact and are ready to use for the coming year. In anticipation of reopening our shelter, we have continued to do regular street visits and interact with children on the streets of Kampala. This has included counseling, sensitization, the provision of medical care, and providing awareness to children of the dangers of living on the streets. In 2019, we look forward to supporting our children in school, providing medical attention to them, and continuing to impact the broader communities in which we work. We thank you very much for your continued support. Olel Oscar : This year our report features a 15-year-old Olel Oscar. He was discovered by our social workers in 2013 during a street visit in Lira. Oscar lost his mother to HIV/AIDs and was left to live with his father. Unfortunately, his father was an alcoholic who would abandon him at home with no basic needs. The situation at home forced him to end up on the streets selling scrap metal to fend for himself. He is a smart boy who continues to excel in school. With the funds we have been able to support Oscar in school. He is in senior secondary two, which is the second year of high school. 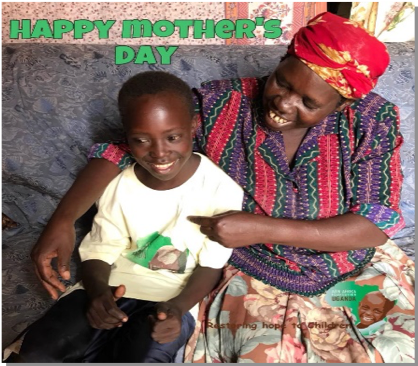 The beautiful life of Opio and his new Mother: We cannot go without mentioning this great selfless mother who has been a great foster parent to our very own Opio Emmanuel. As mentioned in our previous reports, Opio was abandoned to us and the government has failed to trace his home to date. We knew Opio needed some tender love he can call his own from a special person. We would like to mention Lucy Amuge, a mother who chose to take Opio selflessly. We assessed and interviewed Lucy and found her eligible to take care of Opio. With the funds we are able to visit them on several occasions during our family counselling periods as well as giving Lucy financial support to cater for Opio’s downs syndrome medical attention and psychological support. We continued to support the education of our children and also provided books to many other poor students from rural areas. Over 80 mothers were impacted by our income-generating programs. 19 children received medical attention and treatment. We hosted 4 workshops at the Atin center in order to influence policy. We have secured a property in Kampala to begin rehabilitation of children in the capital city. We have received two prominent members who are well experienced individuals. They are going to join us in February. Two of our boys have completed Primary school level and one has joined college to learn a trade skill in carpentry. We continued to support children living on the street. Unfortunately, 3 boys dropped out of school this last term of 2018. We are doing our best to counsel them so they are able to go back to school in the coming new term of school. Unlike last year, we have had many cases of children falling sick in 2018. Many of our students go to government public schools which are often overcrowded and under-resourced. We are working with the government to improve access to resources by providing scholastic materials to the students in rural areas and also encourage other children to stay in school. This gives us a platform to instill awareness of the dangers of street life to vulnerable children. · Education will always be the core objective of our cause at Atin Afrika. In the longer-term, we aim to construct a school within Uganda so that we are able to manage and enroll as many children into school as possible. · With the pressing issue of more children coming to the streets, we aim to help the government to build effective solutions and devise mechanisms that are policy-related. · We would like to develop and implement novel solutions to help alleviate the push factors that lead children to leave their homes. While our support program is a start, there remains much to be done to support vulnerable families. Words alone cannot repay your kindness. We at Atin Afrika deeply appreciate how much you have supported us over the years and are hoping that you continue to support us as we endeavor to impact the children. All this we have done would have not been achieved without your immense support. We are hoping and looking forward to yet another year of our partnership. With sincere gratitude, we thank you so very much!